Development for The Consumer Culture Garden, the most recent example project EAT has worked on, began in June 2004, and originally opened at The North Carolina Museum of Art in September 2005. Our process was based on the Eames design process, reflecting an iterative exploration into a wide range of solutions for every aspect of the installation. 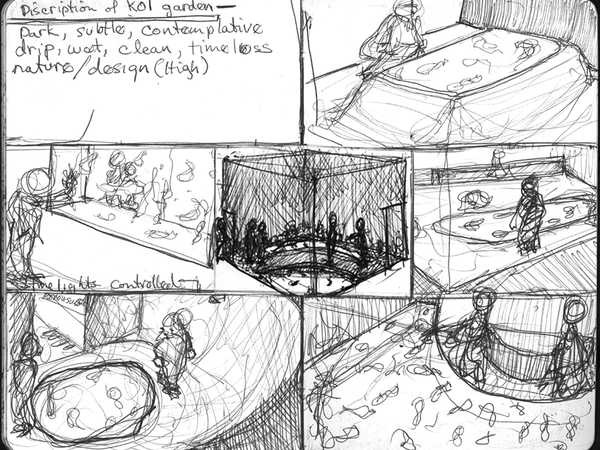 The pond structure was sketched out in a variety of ways, to include curved and square pond shapes, a bridge, walk-up and walk-around structures, as well as multiple raised platforms with individual projections. Similarly, lighting and projection substances, as well as flooring and wall treatments, were considered and tested throughout the course of a year. 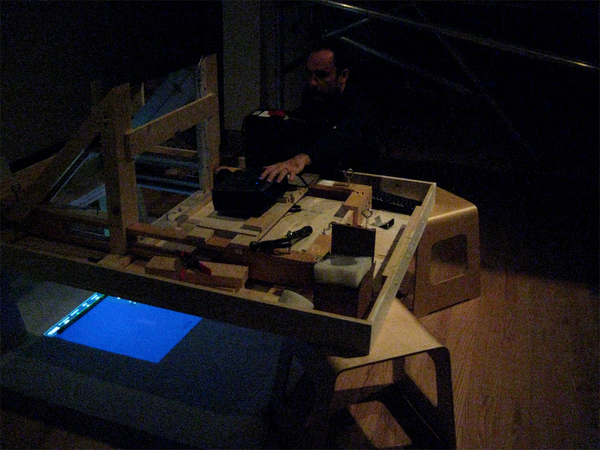 The projected space was created using Adobe Flash, which allowed interactive sensors to engage a user through participation with the real-world environment. The 3-dimensional fish was developed with Maya (3D animation software), enabling us to project both QuickTime movies and graphic images onto their 3D animated forms. Developing the fish movements was a process that also took a full year, as we consistently evaluated the “swim” of a real Japanese Koi versus our animated version. The challenge continued as these animations were then brought into Flash and had to give the illusion of swimming and “schooling” with other Koi fish. Audio tracks were developed in Logic from both recordings and synthesized sound. Sounds were matched to particular interactions (e.g. sensor activation, fish swimming toward viewer) and audio tracks were matched to previously developed Quicktime movies and vice versa. 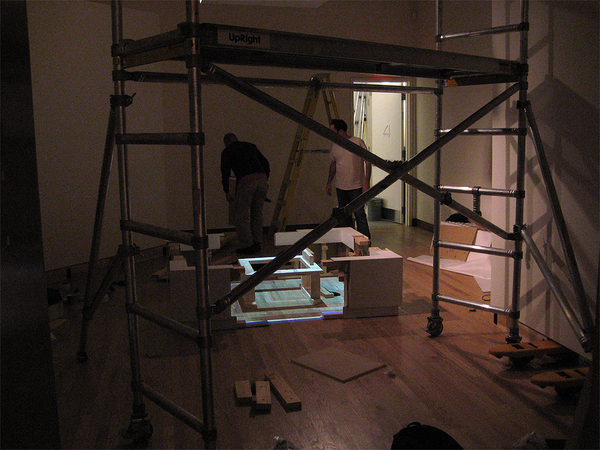 Initial development of conceptual art space for the Consumer Culture Garden. 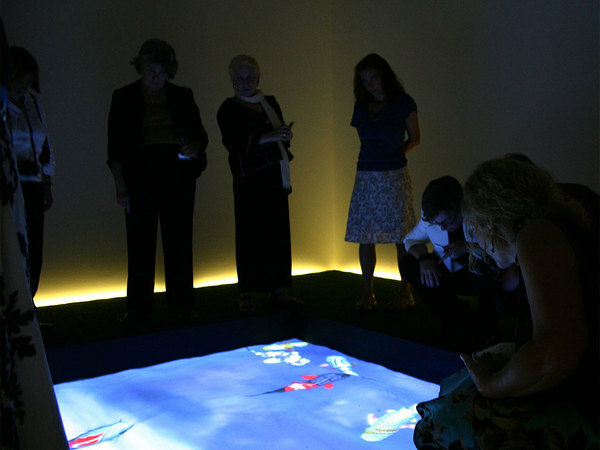 Museum patrons interacting with the digital Japanese Koi pond. 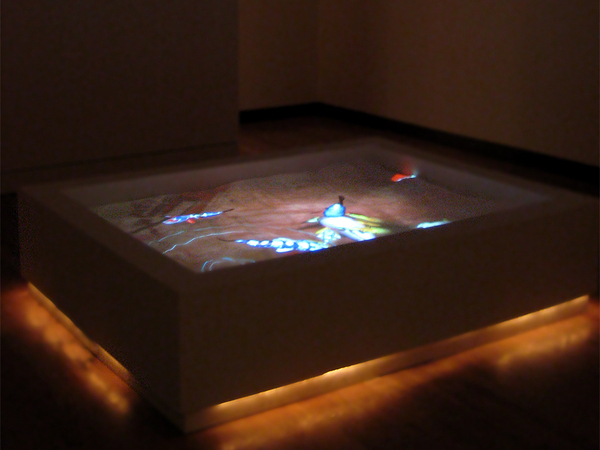 Interactive video projected on salt, 8’x12’ in dimension. Ceiling mounted projector with computer and sensor array. Raised floor with under-mount lighting. 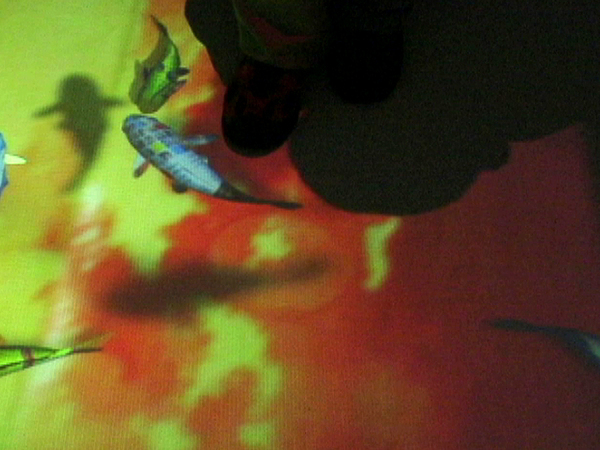 Interactive video projected on salt, 6’x10’ in dimension. Ceiling mounted projector with computer and digital video sensor array. Self contained, raised seating platform with low-voltage lighting. 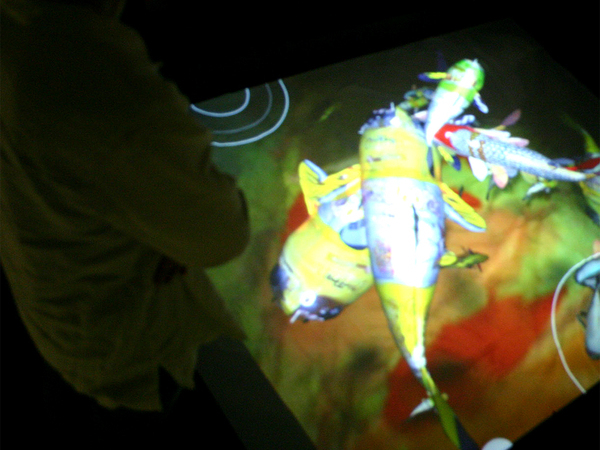 Testing of interactive digital video sensor array, collision detections of artificial intelligent, 3D Koi fish and movements in the camera’s field of view. Fabrication and design of concealed ceiling mount projection system, computer controller and integrated digital video sensor array. Upper assembly was modular and folded into a single package for shipping. Pictured: Pat FitzGerald and David Millsaps, both members of EAT Collaborative.